Hushpuppies (Hush puppies) are a savory starch based food made from cornmeal batter that is deep fried or baked in small ball or sphere shapes, or occasionally oblong or ring shapes. Hushpuppies are a comfort food and frequently served as a side dish. Hushpuppies are a food with strong ties to the American South, although they are available in many areas of America on the menus of deep fried fish restaurants. 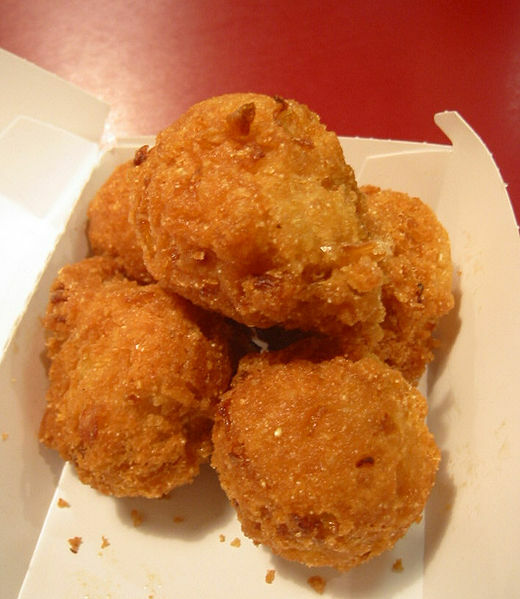 The name “hushpuppies” is often attributed to hunters, fishermen or other cooks who would quickly fry corn meal and feed it to their dogs to “hush the puppies” during cook-outs or fish-frys. In Jamaica such fried breads are known as "Festivals", and are prepared with cornmeal, salt, and sugar then fried in the form of a hot dog roll. They are sweeter than the hushpuppies that often contain onion or garlic instead of sugar. They are served with jerked meats such as pork or chicken. In a cast-iron skillet or a large heavy fry pan over medium-high heat, heat vegetable oil to 350° F or until a small amount of batter dropped into the hot oil sizzles and floats. Do not let the oil get too hot or the center of the hushpuppies will not cook thoroughly. In a large mixing bowl, combine cornmeal, flour, egg, salt, baking soda, milk, and water. Mix until batter is smooth and free of any lumps. Batter should be stiff (if batter is too dry, add milk; if batter is too thin, add cornmeal). Using two spoons, push a small amount of batter into hot oil (370° to 380° F). After about 10 seconds, hushpuppies will float to the top and begin to brown. Fry for approximately 5 minutes or until golden brown, turning to brown all sides. Remove from oil and place hushpuppies on paper towels; continue cooking the remaining batter (fry in small batches, adding 4 to 6 hushpuppies to the oil at a time). NOTE: They can be held in a 200° F oven until serving time (approximately 30 minutes).